Hi and welcome to day one of a blog event that I know you are going to love...the Style Contributors for Ken Oliver Crafts and I have teamed up with the design team of Stencil Girl Products to bring you some of the most amazingly inspiring art all created with products from Stencil Girl and Ken Oliver Crafts! Our blog event is March 23rd through March 27th...so, check back with us every day this week! You'll have the chance to win some incredible prizes from Stencil Girl and Ken Oliver Crafts. 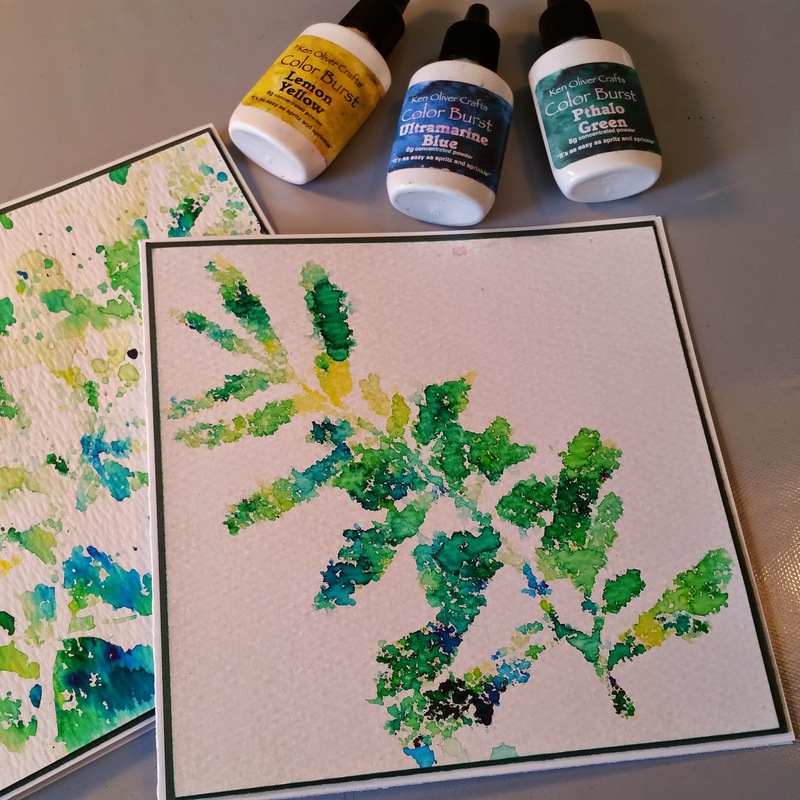 I'm first up on the hop this week and I can't to show you what I've made with Color Burst and 1 stencil from Stencil Girl. Immediately you'll see color burst all over the paper! It's not just an art medium...it's an experience to watch the color develop as it interacts with water! 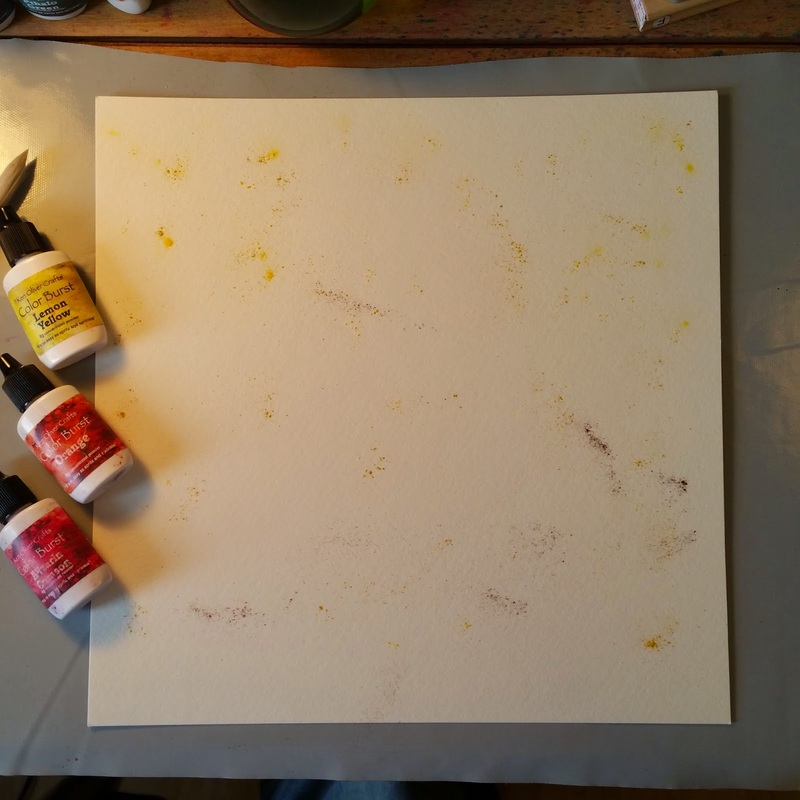 You can spritz a little more water to help blend in the color...and you can use a heat tool to dry the paper. You can achieve some really intensely colored backgrounds just by simply spritzing and sprinkling! 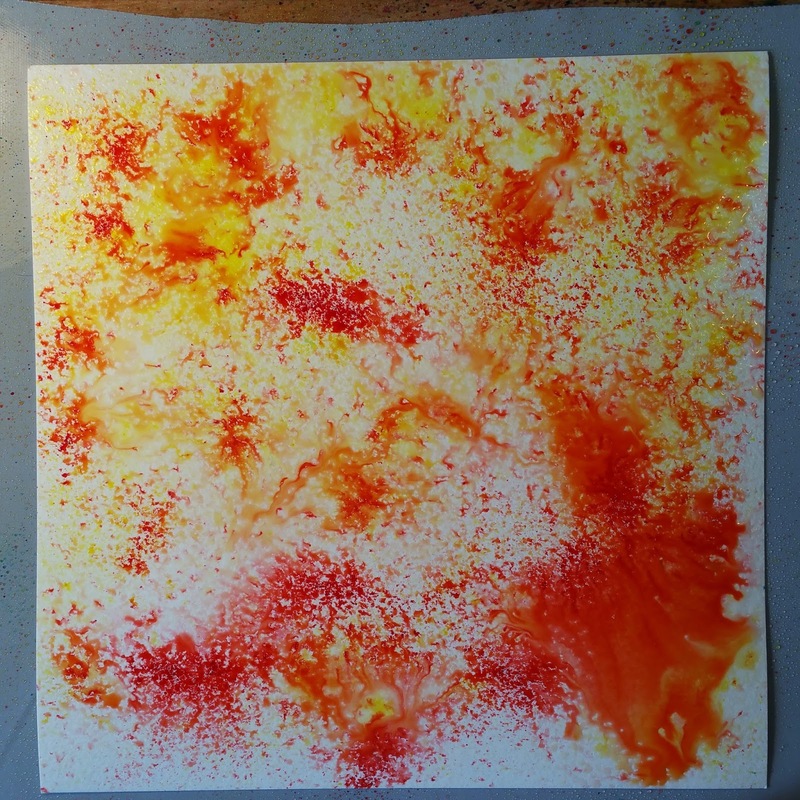 Make sure to use a heat tool to dry the paper in between layers of color. As I started to build up my layers of color...I added some ultramarine blue and violet to really get those colors going. 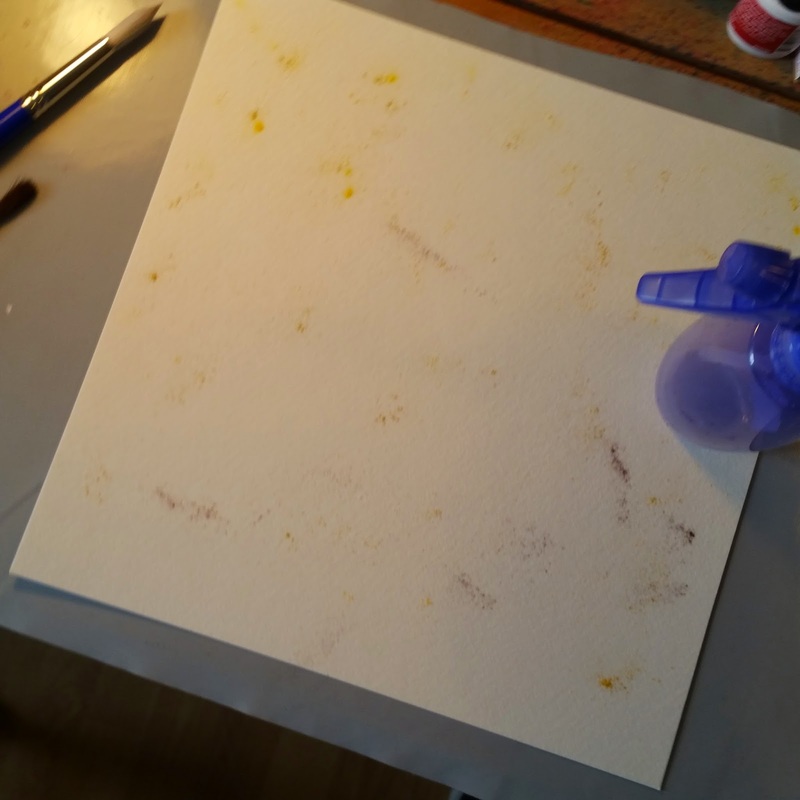 When I got my layers of color how I wanted them, I mottled the background by adding big drops of water to the surface of the paper to "lift out" pigment. 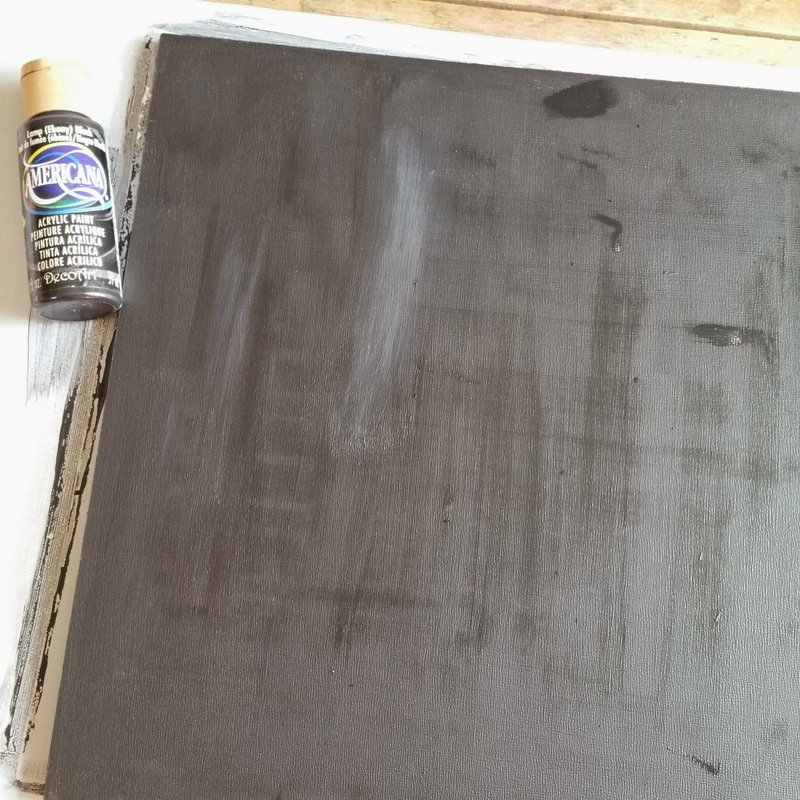 Drip water onto the painted paper, then lightly blot off the water to reveal the mottled pattern you'll get from removing pigment. I even let a few drips run down the page. 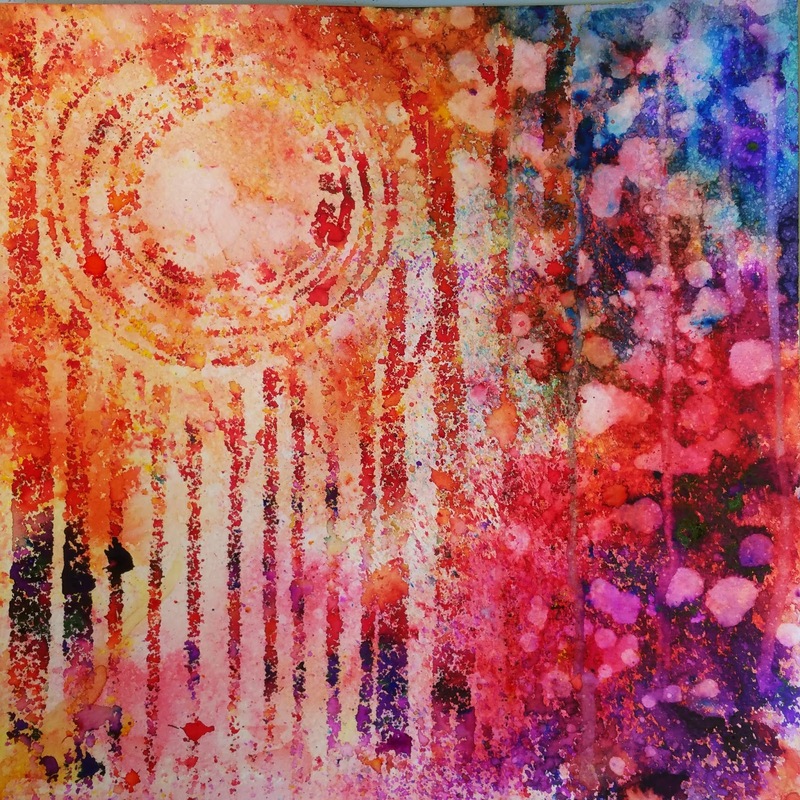 Then to finish the composition, I stenciled the Celestial Grove stencil onto the paper by laying the stencil on the surface of the paper, then sprinkling Color Burst over the stencil, then lightly misting the stencil with clean water. When you remove the stencil, you will be amazed! To give this piece a finished look, I inked the edges of the watercolor paper with a Burnt Orange Click It Ink Pad. Inked edges look great. 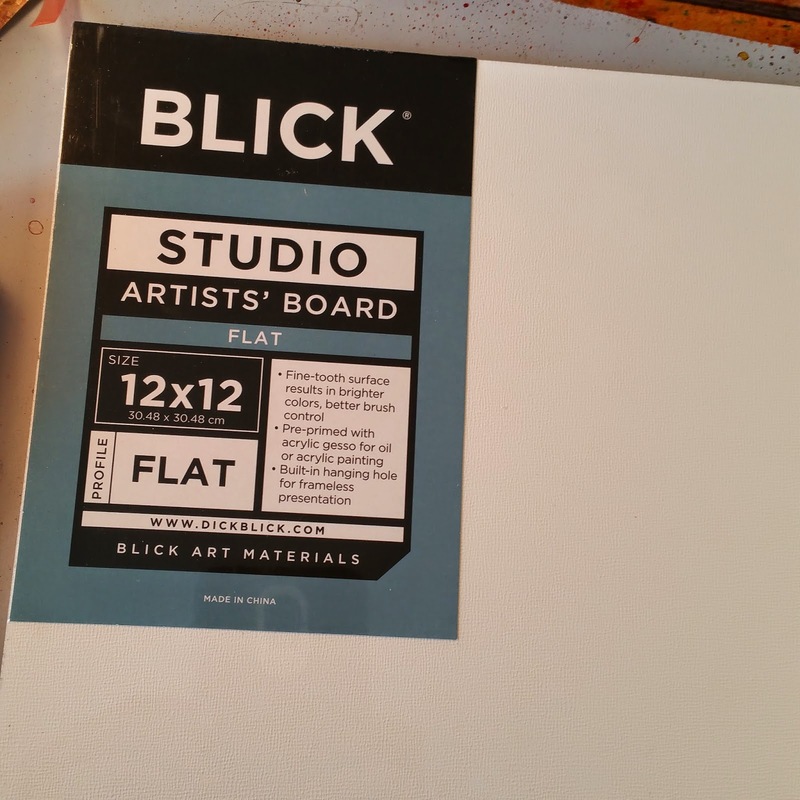 then affix the piece of watercolor paper to the artist's board by applying a thin coat of Mod Podge to the backside of the watercolor paper and placing it on the board. Let it dry, and just like that, you've created a beautiful gallery style watercolor wall decor piece that will look great in any room! I used the same techniques, sprinkle and spritzing with a stencil them affixed the stenciled water color paper to a piece of coordinating cardstock and then glued it to a 6"x6" white card base. 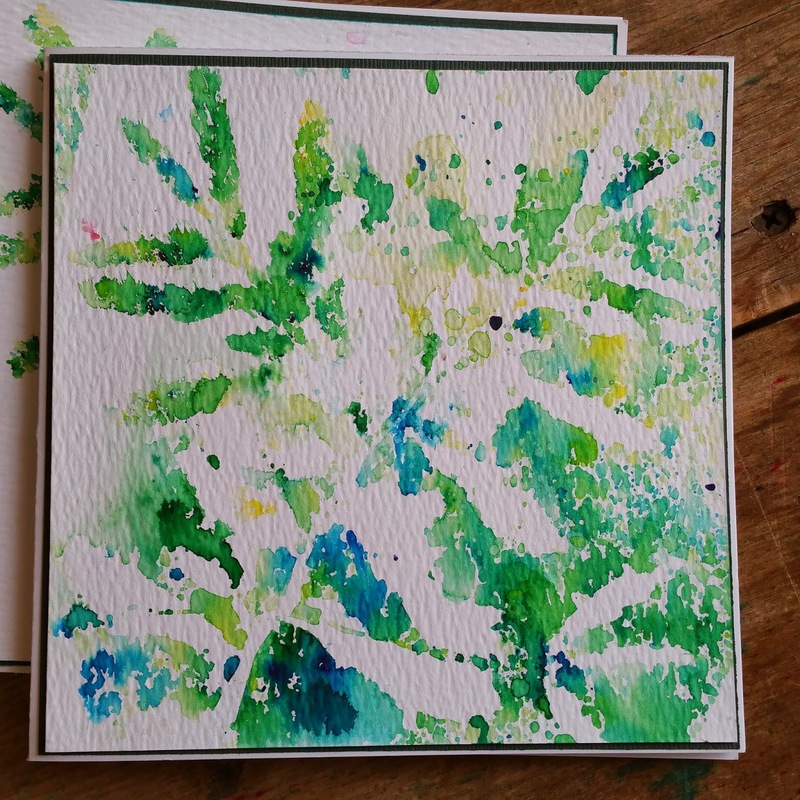 I love the simplicity of these cards, they are very elegant and very artful. Make sure to visit the other blogs on the hop today...I think you're going to love what you see! Thank you for visiting our blogs today and I hope that you'll be inspired to create something wonderful with Stencil Girl Products and Ken Oliver Crafts! We have a crafty haul of prizes from Ken Oliver up for grabs, just leave a comment below and you'll be eligible to win! Winners will be randomly selected from our blogs, just leave a comment to become eligible for a prize. It's easy! We'll list the daily winners in the comments sections of our respective blogs so watch for the winners names. Here's what we're giving away! 12 Daily Prizes - 1 Pack Ken Oliver Crafts 6x6 Papers(24 pieces). Leave a comment on each StencilGirl Talk post and the team members posts to be entered to win a $50 gift certificate from Stencil Girl! If you see your name here, please email me at knoliver62@gmail.com with your mailing address and I'll have your prize sent out to you ASAP. This looks easy and so fun. Will have to try this with my kids. Lovely. I never thought about stencils. Nice work. Looks beautiful. can't wait to try this. Very cute great concepts hey when you coming up north? We came back from Newburgh talking about you and was hoping you would do a class at our craft store in Merrivelle. I can't wait to use these. Are you going to do more colors? I'm loving all the uses of these ColorBursts. Going to have to try stencils now. Thanks for the hop and the chance to win! Wow! love the vibrant colors and super cool effects. Color Bursts are so versatile - is there anything they can't do?!! I am amazed at what you created! The picture is stunning and I just love those cards! Wow, awesome product! Thanks for the chance to win! I'm so happy to see such a cool product, just like any craft supply addict I'd love to add these to my collection!!!! Your creations are awesome! Thanks for sharing. 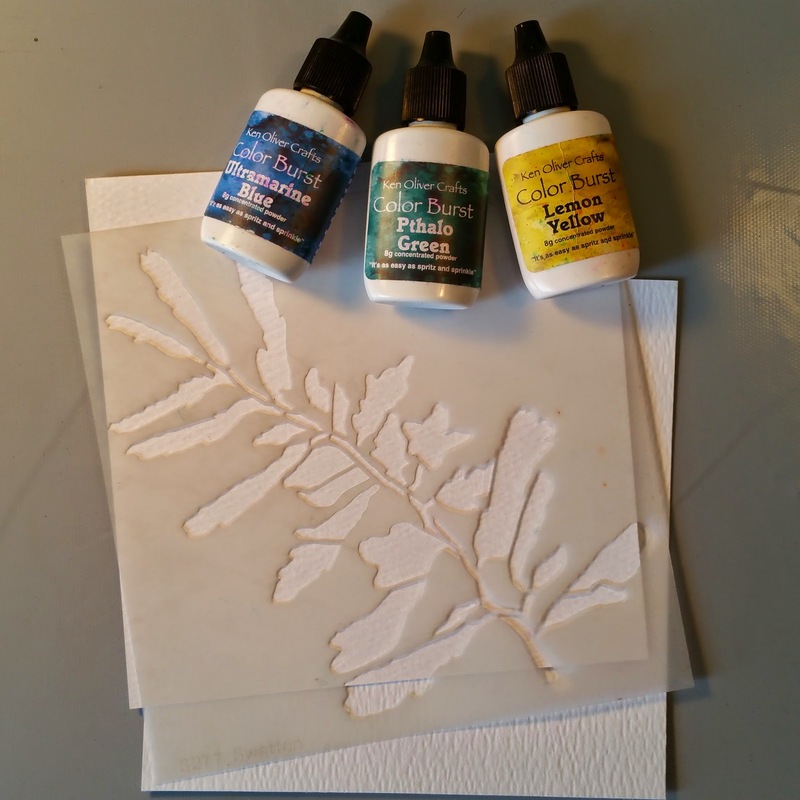 Loved that you teamed up with StencilGirl Products - love those girls! Fabulous art piece you created - wonderful colors! I'm excited for this week and that you teamed up with stencil girl, I have to say I am really loving how the color bursts work. What an amazing product. Your decor price is wonderful. And all those backgrounds are completely amazing. Thanks for the chance to win. Would love to try your products. This is fantastic! I love what you did. It never occurred to me to use stencils with these. Awesome! Love the wall art Ken! Absolutely gorgeous!! Little bottles of AMAZING! This is going to be a fun week Ken! Your projects...pretty darn amazing too! Thanks for letting the StencilGirl team play with your new products :) We think they are the perfect match!!! Wow - this is beautiful! Love seeing these Color Bursts at work adn the setncils are amazing!! I'm a card maker and really enjoyed seeing your take on the greeting cards too. The large project is beautiful. The colors are strong and bold and the picture will look wonderful hanging anywhere in the house. I'll be trying these colors. they sound like a lot of fun and make a great project. I love idea. I will definitely have to do these this week. wow what wonderful colors and creations! thanks Ken!! Great projects Ken. Thank you for being so generous with our SG team. 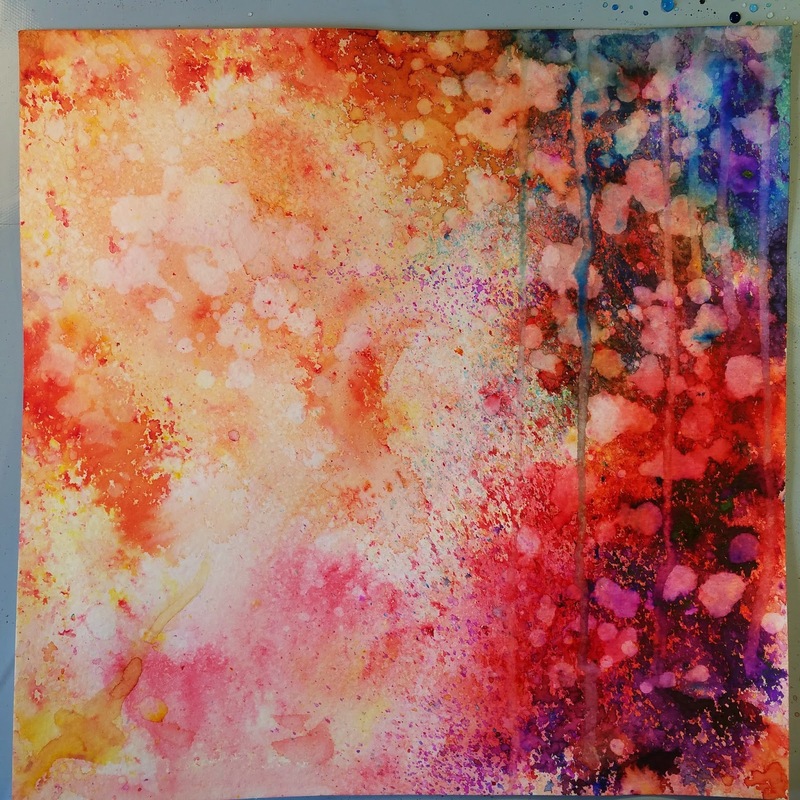 Color Bursts are really a lot of fun to play with! Gorgeous! Your color bursts look amazing! Congrats on the success of them! I just love your Color Bursts. I've been playing with them for a while since I got them from Dave Miller of Rubbernecker Stamps at StampFest in Clearwater, Fl. in February. I've been showing them to friends - they can't wait to try them, so I definitely would love to win some! So glad to see you in our Facebook group!! That looks like soooooooo much FUN !!!!! 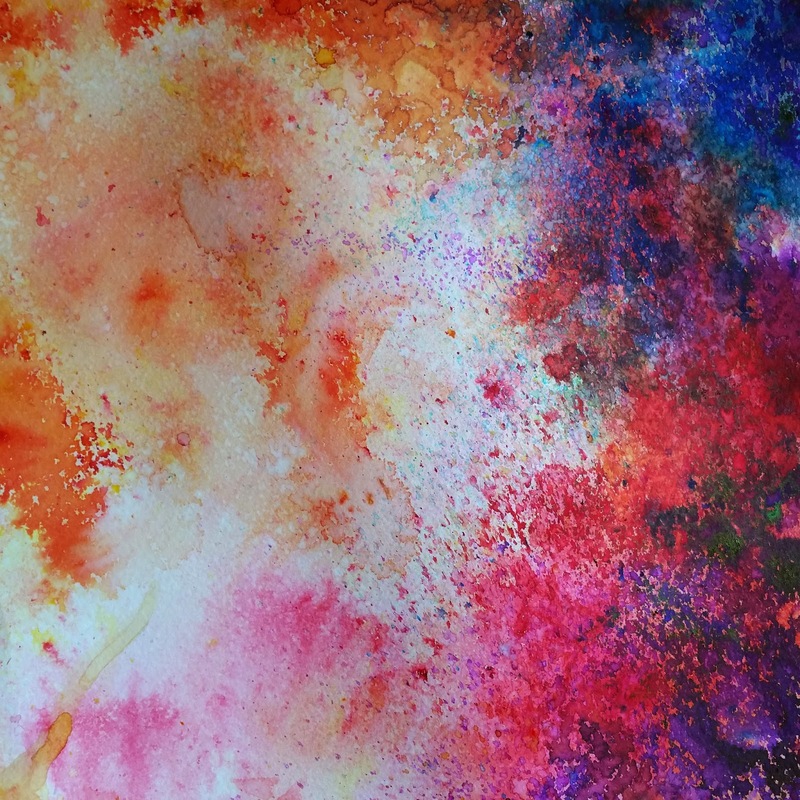 This is the first time I've heard of Color Bursts and you have definitely grabbed my attention with your gorgeous creations here, Ken! I love the spontaneity of these powders when spritzed with water. Thanks for showing your step by step process; I am a very visual person and love seeing how you used these. I love how the colours just pop after spraying with water. Gorgeous projects- loving the colors and the stencils! I am new to color bursts, they look like a lot of fun. Everything I see about the Color Burst powders makes me happy! Can't wait to try them on just about everything! 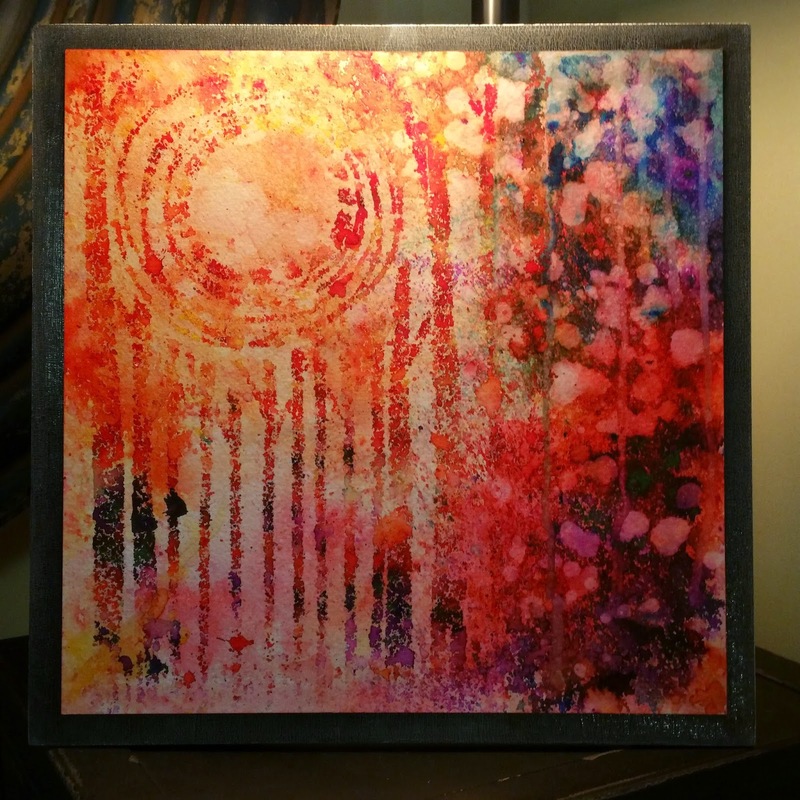 I do love Color Burst and I am a "collector" of stencils! Thanks for the opportunity to win! Love the inspiration. Looking forward to a class with you on Saturday at The doodlebug. Wow! Love the possibilities. 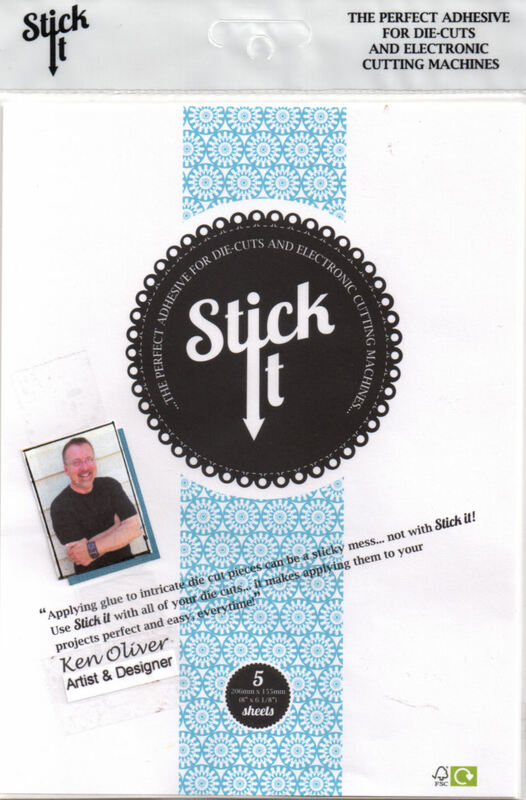 I'm new to Ken Oliver and his products and am so glad to be learning about them. Thanks for this fun blog hop. Oh my gosh, these projects are amazing and the colors are so vivid even after sprit zing with water, a real sign of quality. Looks very Nice! I have not got to try the Color Burst yet. I hope to get to try some in the near future! I am also excited to get your Click its stamp pads & your line of papers! I am looking forward to your Blog Hop this week! Stencil Girl things are nice as well. Thanks & keep up the awesome crafting items! I had not seen the colour burst powders before today. I am very impressed at the depth of colour and the control you have over the hues. Beautiful colors. So vibrant. Your two projects with stencils were excellent. Colour Burst looks wonderful! What a great way to add sprays of colour to one's work. Love your finished pieces. Love the Color Burst.. your piece is amazing. . Thanks for sharing. just beautiful! Glad for your ideas/inspiration. Stunning! 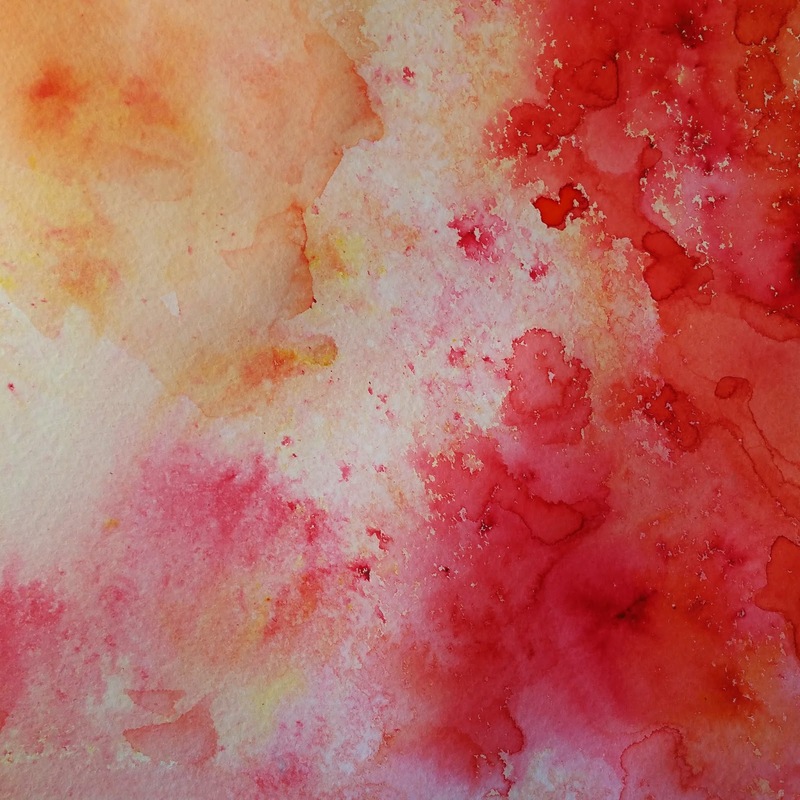 Color Bursts are so versatile--can't wait to try them. LOVE your projects! 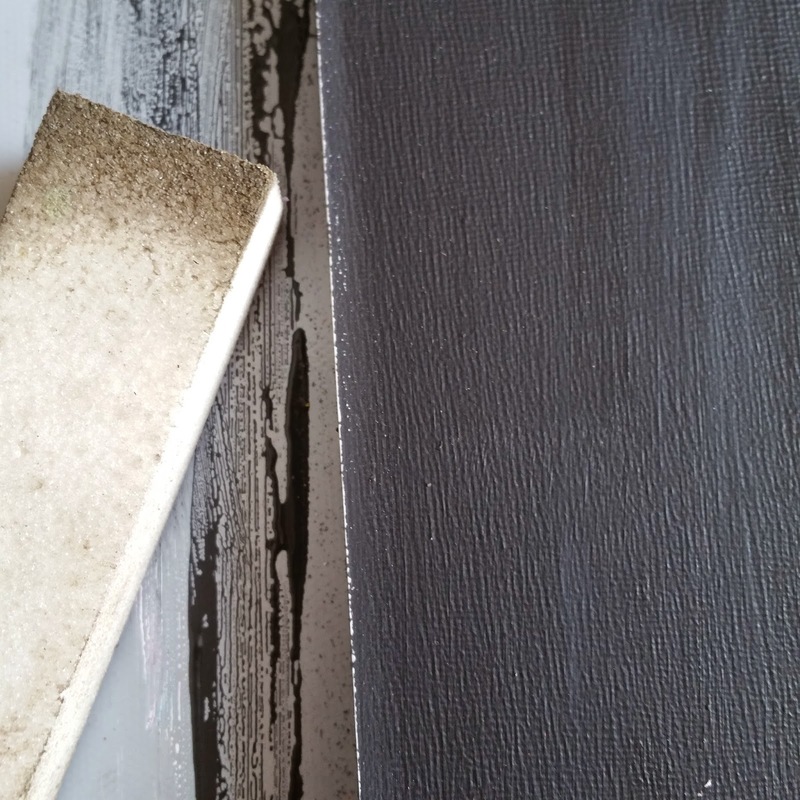 The background on your large piece is gorgeous enough to frame on its own! Love the added dimension with the stenciling. Can't wait to see what everyone else does! This looks like such fun! 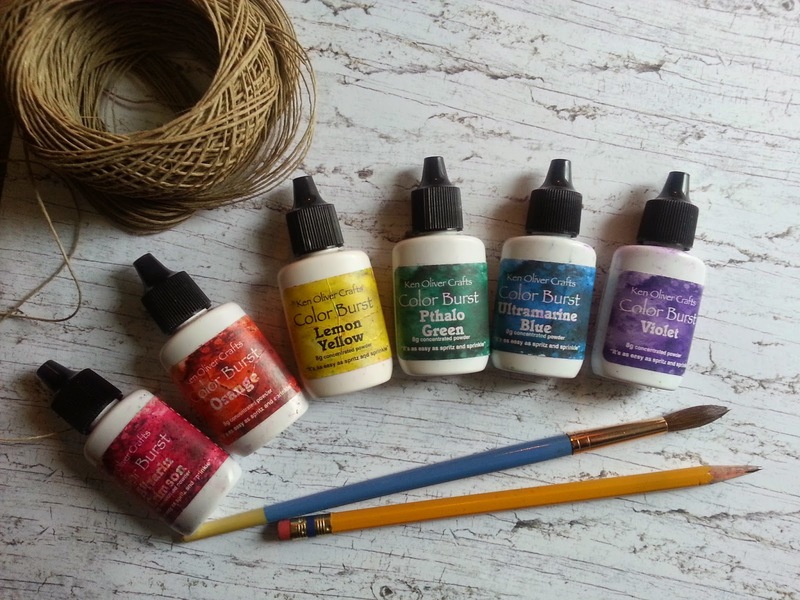 I've never tried color bursts and can't wait to try! Oh My, I am going to have to get a job. I love the stencils, I have quite a few, have to get the color bursts and not the click ink stamps????? wow, this is a visual treat. Gorgeous wall decor piece and card, Ken! Your Color Burst and ClickIt Ink Pads are wonderful!! Can't wait to try your Pegz Alphabet Stamp Set next!! 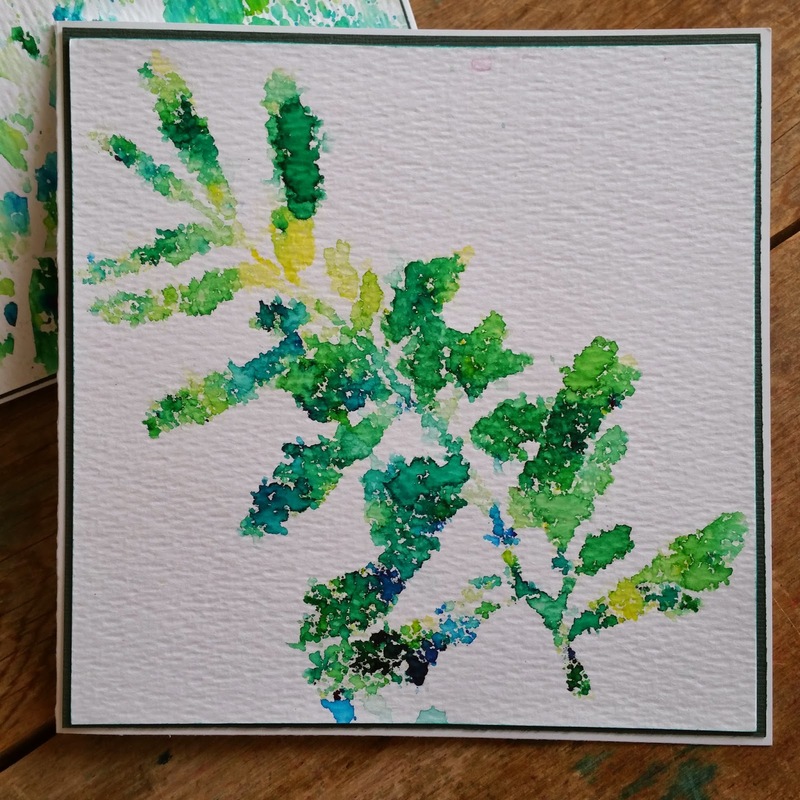 Thank you for choosing my stencil PRESSED LEAVES for part of this post! Your work is beautiful! Have some Stencil Girl stencils, just need some of those Color Bursts. I think I could do this! Thanks for the step-by-step instructions. I love how you used the color bursts. Made an awesome wall hanging and super nice cards. Can't wait to try them for myself. Thanks for the inspiration. Wow this looks really fun. I hope I win. Beautiful! Can't wait to order your Color Burst and give it a try myself. Love the artwork and the combination of product from the two companies. I have never seen Starburst before and the stencil is beautiful. Love the Color Burst sprays! Fun! I need some of your goodies...I want to play! LOVE the look of using the stencils...GORGEOUS!!!! These are AMAZING!!!!! Love the vibrancy and easy use! What beautiful projects. I really like seeing your products in action. Hope to win! So beautiful. I am a big fan of color burst. 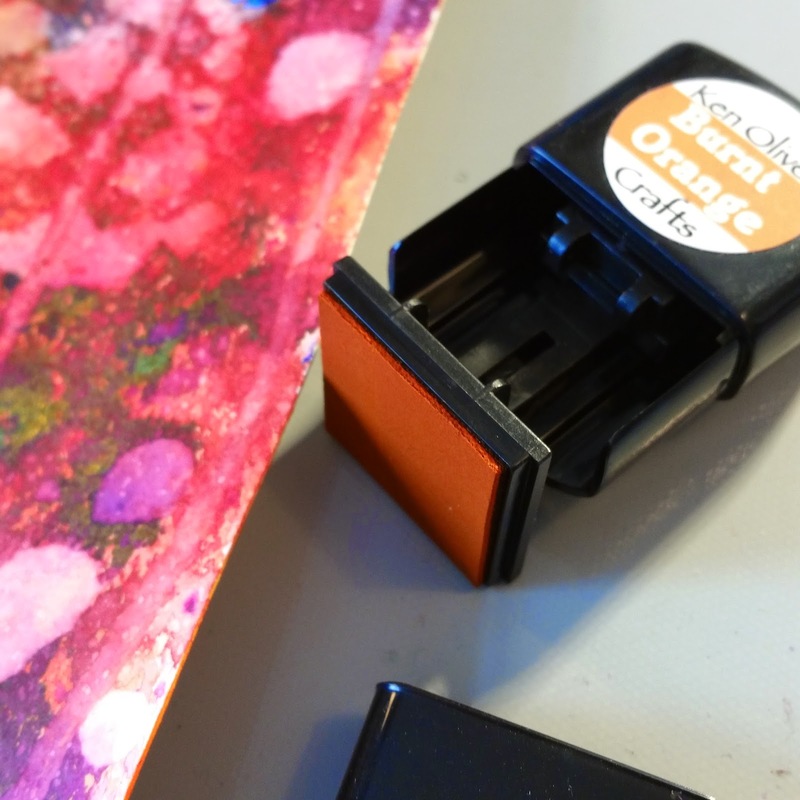 Did not know about the ink pads, have to check them out! OMG! Got my color burst yesterday, 3/23/15, and tried them out!! The colors are amazing!!! This is just stunning! The colors are so vibrant. Can't wait to get my hands on some of these! this is so gorgeous... love the color bursts!! great stencil too! Wow! What a great product! I can't wait to try it - thank you so much for introducing it to us! Thanks for the detailed tutorial. I'm going to try this. 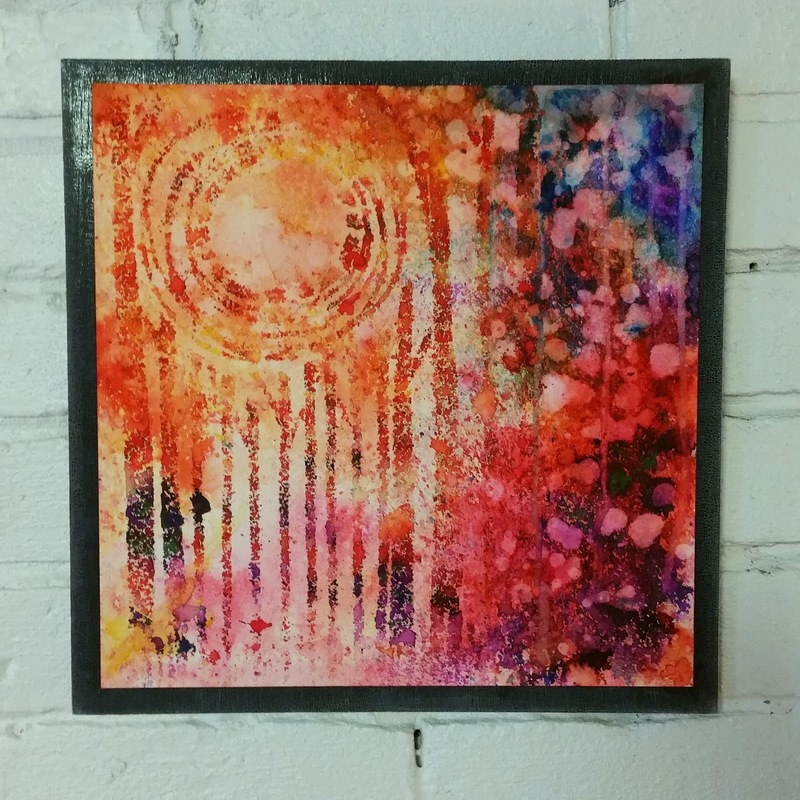 I love that stencil (I have it) and I love your Color Bursts! Thanks for another great demo on how to use them both! Love some color burst!! have to have very soon! Great tutorial! Thanks for a chance to enter the giveaway. 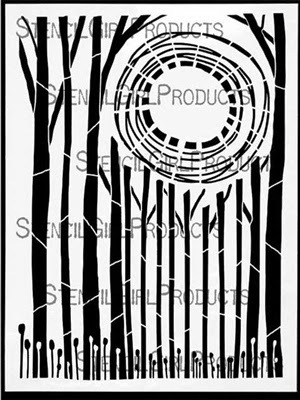 I have always loved the look you have created with these stencils. Your cards are just gorgeous. Thanks for this companies giveaway and the opportunity to win something delightful. You could hang that on my wall anytime, Ken. Wonderful. Was in your class today at Doodlebug. . . LOVE IT! So excited to try your color bursts. waiting on my order to arrive! Luv watercolor techniques! !